Beef is served in multiple forms for special occasions. This is because beef has a unique taste and can be prepared in different methods. Common dishes are beef brisket and pot roast. 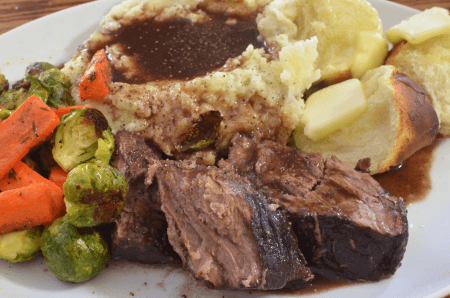 What is the difference between beef brisket and pot roast? Let us find out in this article. Brisket is a cut of beef meat from the breast to the lower chest. It is considered as one of the nine primal cuts of beef. This cut contains connective tissues and collagen fibers. Brisket contains 44 calories, 2.1 grams of fat, and 5.9 grams of protein in a 28.4 gram serving (1 oz). It requires the correct cooking method to become tender. Brisket is usually cooked using the basting technique. This cooking technique allows meat to be cooked in its own juices or a prepared sauce or marinade. Meat is heated for extended periods of time and the sauce are brushed onto the meat to keep it moist during the cooking process. Others prefer to rub herbs and spices on the raw meat then slowly cook it. Then the meat is grilled to become barbecue. In some countries it is prepared differently. 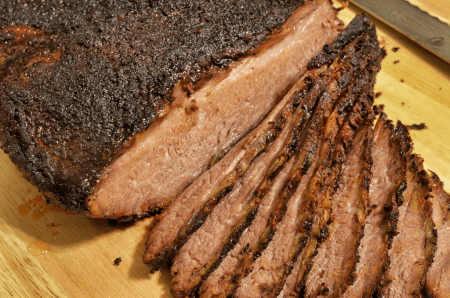 In traditional Jewish cooking, brisket is spiced and smoked to make pastrami. In Hong Kong, it is cooked over low heat for hours and served with noodles in soup. In New Zealand, it is boiled in water with seasonings and served with potatoes and vegetables. In Korea, it is famously cooked on a hot plate and served with lettuce, onions, and hot pepper paste. Pot roast is a braised beef dish. It is made by browning beef to induce a Maillard reaction (a chemical reaction between amino acids and sugars that gives browned food its distinct flavor) and then slow cooking it for hours. Pot roast contains 63 calories, 3.7 grams of total fat, and 6.7 grams of protein in a 1 oz serving. Typical beef cuts for pot roast are chuck steak and chuck roast. These cuts contain fiber which makes them tough and unsuitable for grilling or roasting. Pot roast, when correctly prepared, is very tender and succulent. It is often served with vegetables such as onions, potatoes, and carrots which are simmered in the liquid produced during the slow cooking process. While brisket and pot roast are both beef, there are key differences on their components, preparation, nutritional content, and method of consumption. Brisket is a cut of beef meat from the breast to the lower chest while pot roast is a beef dish made from a chuck steak or chuck roast cut. Brisket is usually prepared using the basting technique so that the meat will be kept moist during the cooking process and become tender. On the other hand, pot roast is braised and then slow cooked to become tender. A 1 oz serving of brisket contains 44 calories, 2.1 grams of fat, and 5.9 grams of protein. The same serving of pot roast contains 63 calories, 3.7 grams of fat, and 6.7 grams of protein. So generally pot roast is less healthy than brisket due to higher fat content. Brisket is served as pastrami in traditional Jewish cooking, with noodles in soup in Hong Kong, and cooked on a hot plate and served with lettuce and onions in Korea. On the other hand, pot roast is usually served with vegetables that were simmered in the cooking liquid during the cooking process.